From NPR’s Robert Krulwich comes the tale of how a bus stop in Milan is making the wait for public transportation more bearable. The answer: Bubble wrap — cut into different sized sheets based on how long you expect to wait. Occupied time, it turns out, feels shorter and less stressful than unoccupied time. So anything that keeps people’s minds and fingers doing something will make the wait seem less excruciating. In other words, who needs emotionally intelligent signage when you’ve got tactilely alluring bubble wrap? Wow..what a great idea and incredibly thoughtful. I’m sure they’ve seen many poor souls pacing and in excruciating pain while waiting for the bus. I don’t know what I did with myself before my iphone in lines. Now if I’m waiting, I just catch up on some reading or play the ever addictive Text Twist. Thanks for sharing this. I just learned of your books through a subscriber of yours on Youtube – Dre Baldwin. I just happen to stumble upon his motivation channel, went to his website and then found you. Great motivator. You gotta love our online world for the connections and people it sometimes brings to us. Keep up the fabulous work. Can’t wait to check out your latest book. Put it on my Xmas list. Happy holidays. Sometimes something this simple is all you need to lighten your day and put a smile on your face. Every work should have something like this around! Distraction? It works especially when we have stress. Perhaps they should keep on hand in hospital waiting rooms. Same principle behind putting mirrors in elevators, no? 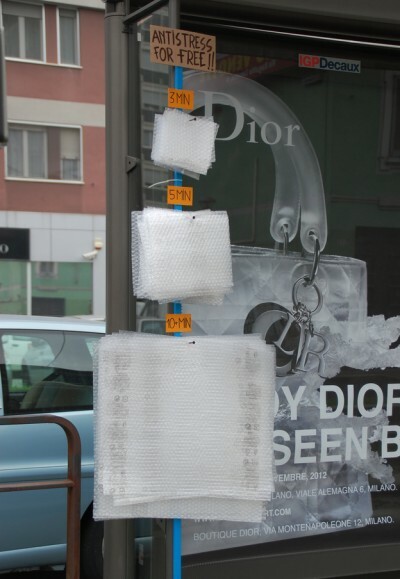 It does worry me whether it is inadvertently creating stress in anyone who doesn’t like the sound of bubble wrap popping! If they don’t have any control over the sounds around them, couldn’t they be feeling much more stressed at the end of a 10-minute wait? Same principle as realising the stress of queueing in heavy traffic can be greatly alleviated by a phone call, especially to a loved one. As can a long car journey through monotonous scenery. Although that’s illegal, hem hem.